A Delta 2 rocket roared to life and successfully boosted a $690 million space telescope into orbit today, the most sophisticated observatory ever built to study the tell-tale high energy gamma rays generated by the most violent explosions and processes in the known universe. 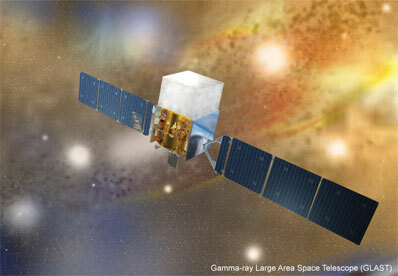 The Gamma Ray Large Area Space Telescope - GLAST - "is going to be a great new instrument for looking at the extreme universe, the high-energy sky, in gamma rays," said Project Scientist Steven Ritz. "It will open a new window on phenomena throughout the universe, such as super-massive black holes, neutron stars, gamma ray bursts, and what really excites us is the unknown. "We want to understand some of these incredibly large systems that seem to put out huge amounts of power that range from as nearby as our sun all of the way out to the edge of the visible universe. It is a new kind of telescope that will show us new things about the universe." Running 20 minutes late because of problems at a down-range tracking station, the United Launch Alliance Delta 2-Heavy rocket flashed to life at 12:05 p.m. and quickly climbed away from launch complex 17B at the Cape Canaveral Air Force Station. The trusty rocket performed well - this was the 81st Delta success in a row dating back to January 1997 - and 75 minutes after liftoff, the boxy satellite was released into a 350-mile-high orbit. A few minutes later, the spacecraft's two solar panels unfolded as planned. Engineers plan to spend about two months testing and calibrating the spacecraft's instruments before science operations begin in earnest. "Everything looks nominal," Ritz said after launch. "We couldn't be happier." The two instruments at the heart of GLAST - the Large Area Telescope and the GLAST Burst Monitor - "will provide scientists an unprecedented view into the high-energy universe, an opportunity to observe some of the most dynamic and powerful forces" in nature, said Project Manager Kevin Grady at NASA's Goddard Space Flight Center. That includes the enigmatic processes that generate cosmic rays; radiation emitted as super-heated debris gets sucked into black holes; and the titanic detonations known as gamma ray bursts that emit more energy in one second than Earth's sun over the course of its entire life. GLAST also may shed light on the nature of dark matter thought to pervade the cosmos. "Gamma rays are the extreme high energy end of the electromagnetic spectrum," said Ritz. "How high an energy? Well, the light that we see with our own eyes corresponds to a few electron volts, which is the unit we use for describing energy. The photons that GLAST will study in gamma rays are literally millions to hundreds of billions of times as energetic. "Since gamma rays are at the extreme high end of the electromagnetic spectrum, it's not a surprise that they tell us about the most extreme environments throughout the universe, places where gravitational fields are extremely strong, magnetic fields and electric fields are absolutely enormous, so large that you couldn't possibly make those conditions on the Earth." In order of increasing energy - and decreasing wavelength - the electromagnetic spectrum runs from radio waves to infrared, visible light, ultraviolet radiation, X-rays and gamma rays. NASA's Spitzer satellite studies infrared emissions from space, the Hubble Space Telescope operates in the visible and near ultraviolet regions of the spectrum and the Chandra X-ray Observatory probes higher energy X-ray emissions. GLAST was built to follow up and extend observations made by NASA's hugely successful Compton Gamma Ray Observatory, launched from a space shuttle in 1991. CGRO ended operations in 2000 with a kamikaze plunge back into the atmosphere. "GLAST is very much a follow-on to the Compton Gamma Ray Observatory, one of NASA's Great Observatories that flew in the 1990s," Ritz said. "The high-energy instrument, called EGRET, really showed us the tip of the iceberg of the gamma ray sky. It told us that we needed to go back and have another look with much greater capabilities." Using state-of-the-art electronics, GLAST is vastly more sensitive than its predecessor, capable of covering a range of energies differing by a factor of 10 million. That's somewhat like a piano spanning 23 octaves. "EGRET answered a lot of questions but left us with so many more questions and it was really quite compelling to the science community to go back and have a much more detailed look," Ritz said. "It's really like the human race is getting a new pair of glasses to see the universe in gamma rays." The 3-ton Large Area Telescope can "see" 20 percent of the sky at any given moment, similar to the scale of a human eye's view. To detect gamma rays, the LAT relies on the tools of high energy physics, detecting the creation of electrons and antimatter positrons as gamma rays smash into thin sheets of tungsten. The trajectories of the electron-positron pairs are measured to determine where the gamma ray came from and a calorimeter at the base of the LAT measures how much energy the particles represent, and thus the energy of the original gamma ray. For every gamma ray detected, the LAT must filter out 100,000 to 1 million cosmic rays that can resemble the particles produced by gamma ray collisions. Appropriately enough, the instrument was assembled at the Stanford Linear Accelerator Center in California. "One of the great new advancements of GLAST is the instruments have a very wide field of view," Ritz said. "In fact, the high-energy instrument sees about 20 percent of the sky at any one time. That's very much like our own eyes. Since we are in low-Earth orbit, it takes about an hour-and-a-half to go around once. In just two of those orbits, or three hours, we will be able to take that field of view and sweep it across the entire sky. So we can observe in all directions in just three hours, and be able to do that over and over again. That's a very important new capability." The other major instrument on the satellite is the GLAST Burst Monitor, or GBM, made up of 14 detectors. Twelve detectors are sensitive to X-rays and low energy gamma rays while two are designed to detect high-energy gamma rays. The energy range overlaps with LAT's and should lead to the detection of 200 or more gamma ray bursts per year. Ritz gave a brief overview of things to come once GLAST is fully operational. "Throughout the galaxy are very rapidly spinning neutron stars," he said. "A neutron star is the collapsed core of a very massive star. It's so dense that a billion tons of neutron star material would fit into about a tablespoon. The magnetic fields are enormous. These things are spinning around sometimes a thousand times a second, making huge beams of very strong magnetic fields which when rotating makes strong electric fields which accelerate particles and generate gamma rays. We'd like to know what is the geometry of those systems, where are the gamma rays emitted, how do they work? GLAST will be very important for that, combined with radio observations. Super massive black holes are though to lurk in the cores of many galaxies, including Earth's Milky Way. As material gets sucked in, it is accelerated to enormous velocities and friction generates extreme temperatures. "A black hole has a huge impact on its environment," Ritz said. "And the environment has a huge impact on the black hole. And in the centers of galaxies where there are these immense black holes and a huge amount of material for them to eat, as the material falls in enormous amounts of power are liberated. In fact, we see coming out of these galaxies very collimated jets of very high energy particles that are literally blown clean out of the galaxy. "We'd like to know how that happens, how is this possible? When those jets happen to be pointed roughly toward our direction, we see the galaxy and the core of the galaxy as incredibly bright in gamma rays. So much power is emitted just in gamma rays that it's the equivalent of all the suns of an entire galaxy shining over all wavelengths. And the sources are variable on various timescales from minutes to years. "What is that variability telling us? What kinds of clues is it telling us about what composes the jet and how is this even possible? GLAST is going to be key for studying this because we're going to be able to see the entire sky every three hours, be able to probe that variability over vastly different time scales and that's just a bonanza to scientists interested in studying these systems." Gamma ray bursts, the most powerful explosions in the known universe, are another critical area of research. "Once a day somewhere in the visible universe there's an enormous explosion," Ritz said. "In about a second, enough energy comes out that it's comparable to the amount of energy that will come from our own sun over its multi-billion year lifetime. We'd obviously like to understand these things better. The key thing that GLAST is going to provide is to tell us what the energy budget is for these incredible engines. We'd like to know how they work, we'd like to know how high in energy they can go. GLAST is going to open up a key new energy band for their study." Said Deputy Project Scientist David Thompson: "There are gamma rays coming from all directions. The Milky Way would be a brilliant swath of light, and you'd see a sky constantly changing with objects dimming and brightening on different time scales. If you see a blinding flash, that would be a gamma ray burst." But Ritz said GLAST will do more than study objects astronomers already know about. It will discover objects and processes that astronomers have not yet imagined. "With such a huge leap in capabilities," he said, "I'm expecting that the most important science GLAST is going to do that we're going to be talking about years from now is actually not yet on anybody's list."